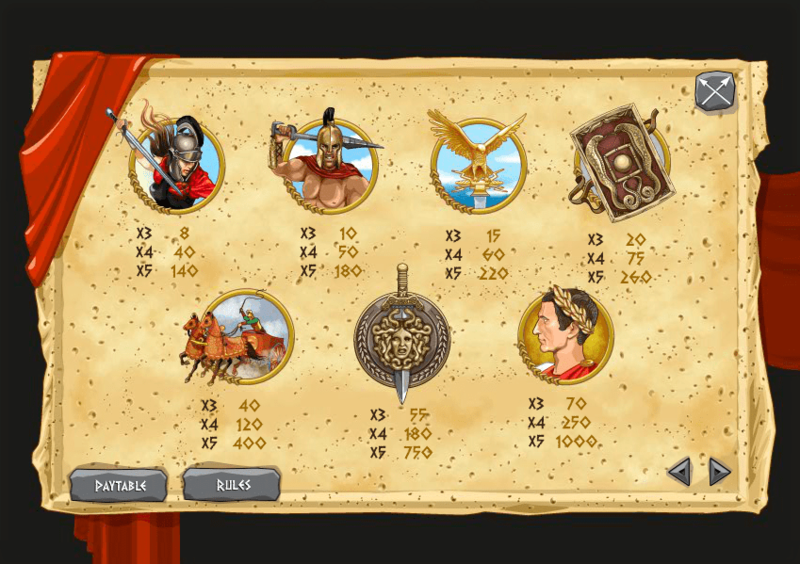 Here's a great new online slots game from 1x2 Gaming which you can play. Super strength is one of the most desirable powers for most of us. Who wouldn’t want to spend the day as a gladiator? In this Vegas online slots game, you can get your chance to be one! Players will test their courage, strength and perseverance in Gladiators Of Rome. Here you’ll encounter other gladiators, find symbols of the Roman Empire, collect swords from vanquished gladiators and become Caesar's Champion. It’s an action-packed best slot games that promise to have you intrigued from the beginning. The stakes start from 0.2 coins a spin, allowing every challenger to enter the arena. If you love promo's, get the best slot offers today. 1x2 Gaming is a well-known company is the slot world. They specialize in virtual sporting games. These allow players to bet on virtual football matches together with other fixed odds, fast win type of gambling. 1x2 Gaming started off with formats like Flash and HTML5 for casino games. Slots seemed like a natural upward direction for these creators. Their games don’t have any out-of-this-world innovations, they keep it simple and easy, and any beginner gambler can stand a chance of winning. Gladiators at 240 BC must have not been considered anything more than a pawn of entertainment. Some revered them, others feared them, but most considered them nothing but a puppet for amusement. However, everyone agreed on their strength. Gladiators are pure warriors- fighting animals, each other and people twice their size just to save themselves and escape unscathed (sometimes). In this online slot game, you’re going to feel the intensity of the battle. The setting is in the desert, where players are set to train fiercely for battle against other warriors also fighting to get the rewards you’re after. It’s time to prove yourself to Caesar. Players must prepare to throw themselves into battle right when the first reel spins. A coin-bet here can multiply your winnings by 180x when you defeat select gladiators. It’s very important that you remember to pick up the trophies afterwards. Golden Eagles multiply your bet by 220x, shields get you 260x, chariots 400x, and the swords 750x. However, to attain the highest coin bet which is 1000x, you need to strive to become Caesar's Champion. Wild Gladiators - These ones work for you and defeat your opponents to open more winning pay-lines for you. 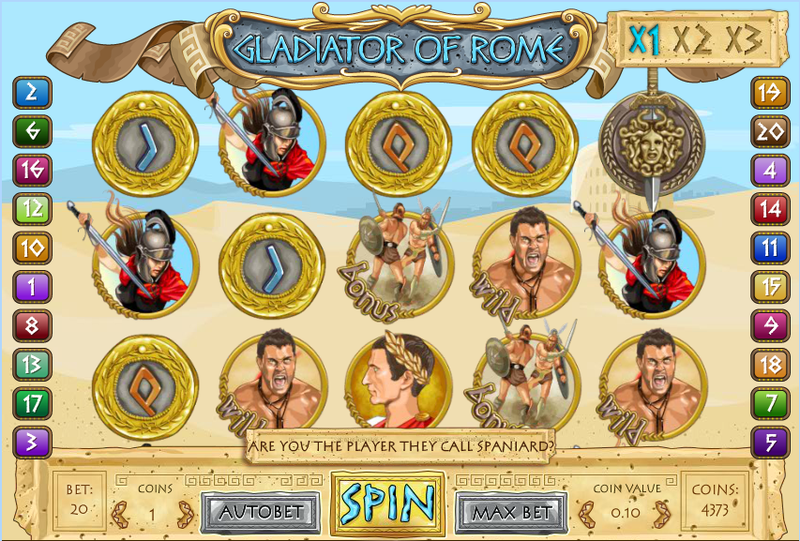 Bonus Bouts - Complete your gladiator task and you receive up to 30 free spins plus a multiplier feature that slowly increases the value of your prize. The first 10 free spins will have prizes paid out as normal, in the second set of free spins value of prizes will double, and in the final 10 prizes will triple in value. Do you have a taste for action? This slot game will definitely get your senses and reflexes fired up. The great thing about it is that you can start your bets from as low as 0.2. There’s not a lot of bonus rounds here, scatters or super wilds, but you’re getting a whole lot of entertaining fight scenes and the prizes are enticing. Give it a shot if you’re courageous enough to strike off the gladiators who’ve already made a reputation in the arena.